Belle Isle is steeped in history from the time when Native Americans lived here, through the arrival of the Spanish and English, the American Revolution, the rice plantation years, the Civil War, the lumber boom of coastal South Carolina and the present age of conservation of wildlife and natural resources. Battery White is a large earthwork battery, built circa 1862 as a Confederate fortification and located on a bluff overlooking Winyah Bay in Georgetown, South Carolina. It was originally part of a plantation which was at one time owned by Revolutionary War Colonel Peter Horry, and is now included in a condominium complex. During the Civil War, the Federal plan of attack (from 1861) included blockading and eventually capturing major ports of the Confederacy. Even prior to this, however, Winyah Bay had been recognized as important to the defense of the state. 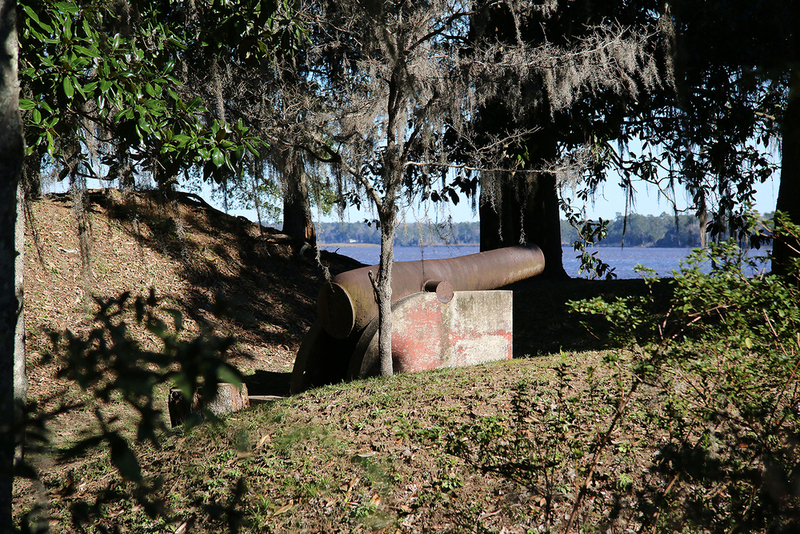 In December of 1860, Charles Alston, aide-de-camp to Governor Francis W. Pickens, encouraged the low country planters to assist with the erection of the batteries. In 1862, it was reported that Major General John C. Pemberton, CSA, of the Confederate Army had visited Georgetown and selected Mayrant's Bluff as the site of the battery. Battery White was apparently built sometime soon thereafter. "The position itself is a strong one, and with a proper artillery and a sufficient infantry support might be rendered almost, if not absolutely, impregnable." "The battery was found to be a well-constructed and formidable work, mounting 15 guns, of which are X-inch columbiads. The previous accounts of the this battery had varied so much as to render our knowledge of it uncertain. Generally, it had been much underrated and supposed to be unable to resist the attack of a single vessel or a few men. But we can now understand that it was a well placed, well constructed and strongly armed, so that we should have had some trouble to reduce it if well manned." With the occupation of Georgetown accomplished, Dahlgren reported heading for Charleston on March 1. As the Harvest Moon began its way down the harbor, however, it struck a torpedo and sank. At low tide, the remains of this vessel can still be seen. Authors: Kappy McNulty and Donald R. Sutherland of the Historic Preservation Division of the South Carolina Department of Archives and History. Battery White remained undisturbed for more than a 100 years, being part of the Belle Isle Plantation. Although the plantation exclusive of the battery was developed as a condominium community in the 1970s, a 501 (3) (c) organization was incorporated in 2016 to preserve original remnants of Battery White and promote awareness of this coastal treasure.